The components of a rainwater harvesting system are fairly simple and there is a low level of maintenance required once it has been installed. It consists of a collection system such as a roof or patio, a reservoir or tank that stores the water and conduits that deliver it where it needs to go. If you have a ground rainwater harvesting system then you will need some kind of pump to get the water back into your house and there are also various filters that get rid of any debris which gathers in your guttering and on the roof of your property. Find out about the different types of rainwater harvesting system. There are various types of rainwater harvesting tank on the market that can either be used in a loft or on a roof, at ground level or buried underground, depending on your preference or circumstance. Most of the tanks available on the market are now made of polyethylene plastic that is long lasting and highly durable. The problem with polyethylene is that it can be effected by sunlight that can degrade the quality of the stored water in hotter climes. Larger rainwater harvesting tanks tend to be made of polyethylene which is surrounded by something like a steel case. There are several ways of getting the stored water from the tank to the parts of your building that need it, like the washing machine or toilet. In taller buildings you can have a loft or roof based tank that works by a gravity feed – this is more popular with commercial premises rather than domestic properties where the benefits of a ground tank outweigh a raised one. A full pump system: This moves the water directly from the tank into the piping array and is delivered straight to the toilet, washing machine etc. The mains water is also fitted to the tank so that if levels of harvested water fall then it can take over quickly and efficiently. The downside of this kind of system is that it uses a little more electricity to drive the pump than other methods. A combined pump and gravity system: This essentially pumps water first of all up to a storage tank in the loft where it is then distributed by gravity. 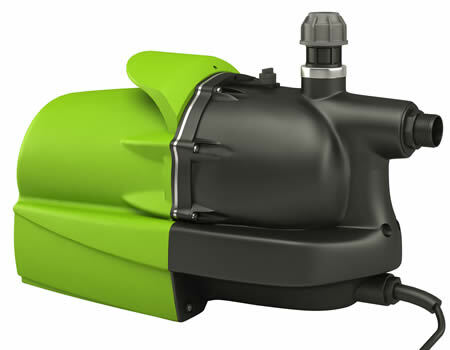 The benefit of this is that it is more energy efficient than a full pump system because it uses less electricity. If you are having a rainwater harvesting system installed you will need to include the piping that delivers water directly to the areas that you need it. The major issue is to ensure that all the water that hits the collection source such as the roof all drains towards the tank, so rather than multiple drain outlets from gutters you will have just one. 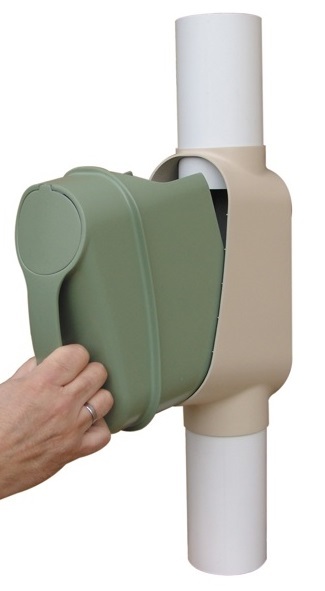 The filter system for a rainwater harvesting installation will vary according to the brand but they all have the same purpose, to reduce the amount of debris going into the tank. There can often be a number that vary in size as the water travels towards the tank. 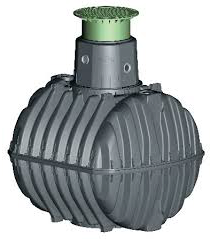 For instance you will have a leaf filter closer to the roof and a finer filter mesh for the turret of the tank. For more advanced installations you can get a monitoring system that will give you information on the water level, pressure and temperature as well as various diagnostics. These can help reduce the need for maintenance and are a cost effective way of keep track of your system, especially for larger, commercial premises. When it first rains most of the bad debris and dirty water will come down the pipes in the first minutes, particularly if there has been a prolonged dry spell. 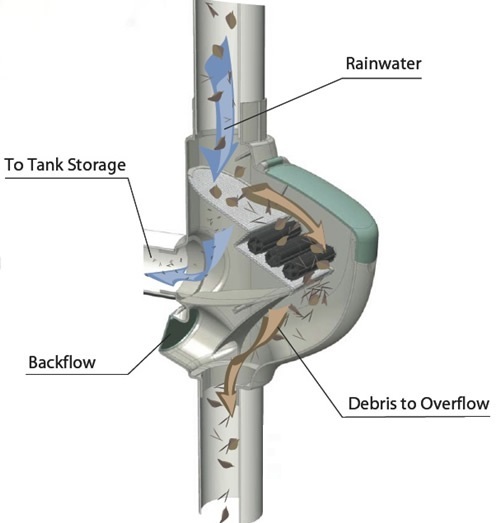 The First Flush Valve expels the first amount of water so that it doesn’t go into the system primarily because it will contain the highest proportion of pollutants. Most slate and terracotta roofs are suitable for rain catchment, and new builds, especially commercial rainwater harvesting systems, may use galvanised metal. In general, the smoother your roof is the more efficient your water collection will be. Gutters should slope down to the outlet pipe as much as possible as areas where water can collect give the chance for bacteria and organic materials to collect. If you have trees that shed their leaves in the autumn then it is a good idea to install gutter guards that stop falling leaves and branches from clogging up the system. Because they are fairly simple devices, rainwater harvesting systems are generally robust and require low maintenance. The area that may cause a problem is the pump which could, of course, breakdown and need to be replaced. The rest of the maintenance regime concerns keeping areas like the guttering clear and changing filters. Find out more about maintaining rainwater harvesting systems.